German Lutheran theologian and pastor Dietrich Bonhoeffer was one of the most widely-revered Christian martyrs of the 20th century. A member of the German resistance movement of World War II who wrote compellingly and poetically on numerous subjects, principally the correlation between a man’s actions and his beliefs and the need for unity within the Christian community. Bonheoffer was arrested by the Gestapo and hanged without trial in April 1945 at Flossenburg concentration camp, less than a month before the capitulation of the German government. His efforts were not in vain. In an outburst of hyperbole that nonetheless demonstrates the high esteem in which the German resistance fighter is held, former Prime Minister Kevin Rudd declared Bonhoeffer ‘the man I admire most in the history of the twentieth century,’ and his impact continues to resonate around the world. Doblmeier’s documentary is a gripping and cleverly constructed work that presents the definitive life of this unassuming yet hugely significant theologian, utilising interviews with family and friends, period footage and archival stills to create a highly effective visual tapestry. Nothing to shout about here, to be honest. The picture quality is rather poor, with very soft image quality throughout and a rather lacklustre English 2.0 the only audio option. In fact the DVD release seems to have been transferred from a VHS master tape, which is an unusual decision to make in this day and age. 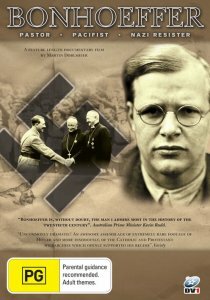 Any deficiencies are compensated for by the strength of the material, but still, a sharper transfer would have been desirable considering this is the only major exploration of Bonhoeffer and his role in 20th century theology, not to mention the anti-Nazi movement. None, the local release is bare bones.